Established in 1925, we at Ashton & Moore have the experience and technical knowhow to undertake successfully a wide variety of finishing processes including plating, anodising, painting and electroplating. 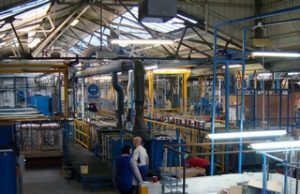 Following a successful MBO in 2004 the company was relocated to a single story open plan factory in 2006, allowing much of the equipment to be replaced and provide a more logical, ergonomic layout. The new factory has achieved full re-accreditation from all existing customers and approval bodies including Nadcap. The company also achieved a smooth and successful I.P. site closure for the old site together with full I.P. approval for the new site. Proprietor managed, Ashton & Moore has remained one of the UK’s leading aerospace and defence finishing services supplier. Ashton & Moore continues to strive to achieve a cost effective responsive service for their customers. Our technicians, committed and experienced in this our specialised field, together with our new layout and equipment, ensures that we provide only the very best results, frequently exceeding the quality and delivery requirements of any manufacturer.